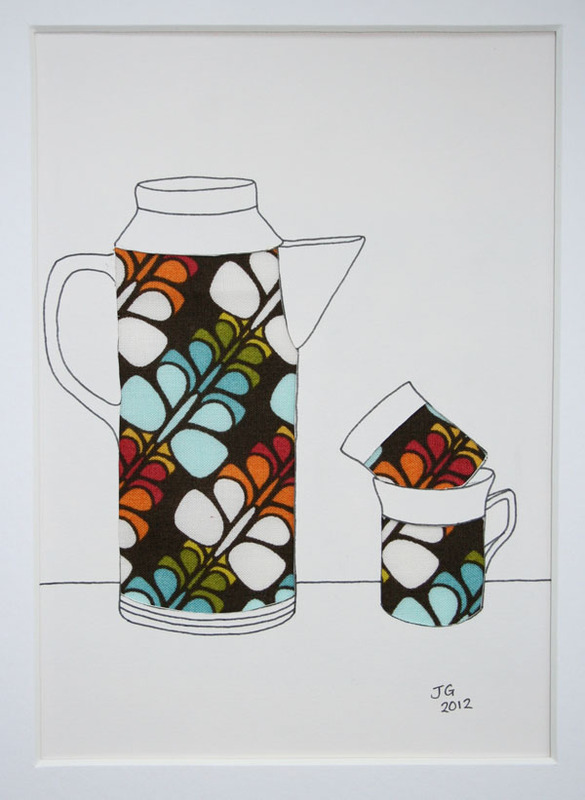 I’m working on some pictures at the moment but still really like my retro teapot and cup and now it’s been featured on a blog called ‘Fresh on Folksy’! You can also find it in my Folksy shop of course, along with some other pieces. My latest drawing is seventies inspired; I still remember our brown and orange floral sofa and matching curtains in our living room when I was growing up. The fabric is from Cloud 9’s Across The Pond collection designed by Michelle Engel Bencsko and is called Variegated Butterflies. Cloud 9 Fabrics say the collection is ‘a fab mix of art nouveau and 70’s mod all revolving around a gentle aquatic locale theme’. I think it goes well with the seventies coffee pot, it’s very me!